The Gospel for this Sunday can be summarized: Jesus went about doing good, healing the sick and revealing God’s love for all. St. Paul tells us the Jesus did this out of his goodness, not to please himself, not to glorify himself. From love for us, he took insults upon us upon himself. St. Paul concludes, “Welcome one another, then, as Christ welcomed you, for the glory of God” (Romans 15:7). In this way, we can heal one another’s spirit. Today’s epistle and gospel, then, tell us what love for one another really is. There is a condition, though, we must be open to God’s love. What does Jesus ask the blind men? 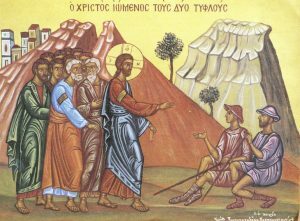 “Do you believe I can do this?” If they believed they could be healed, then they also believed they needed healing, unlike the hypocritical Pharisees, to whom Jesus says, ““If you were blind, you would have no sin; but now you are saying, ‘We see,’ so your sin remains” (John 9:41). They, in bitterness and unfaithfulness, hurl the insult at Jesus, “He drives out demons by the prince of demons” (Matthew 9:34). We are blind to the image of God in the other when we “demonize” them, and in reality, makes ourselves into demons. We should, instead, heal one another and not condemn.